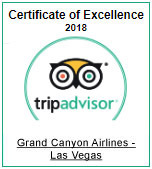 Make the most of your Grand Canyon West experience with Grand Canyon Airlines. We’re proud to offer the thrill of flight to visitors already touring the canyon’s West Rim. This air tour departs from the Grand Canyon West air terminal and flies you over the canyon’s most notable landmarks. Take in glorious views above Eagle Point, home of the famous Skywalk glass bridge, Guano Point, and other areas of interest within the West Rim. As with all Grand Canyon Airlines tours, narration in your language will highlight interesting geological facts and explore the history of the Grand Canyon. Upon return to the air terminal, you’ll board an air-conditioned shuttle for a self-guided ground tour of Grand Canyon West. This hop-on/hop-off shuttle stops at each of the important viewpoints along the rim of the canyon. At Hualapai Ranch, Western charm sets the tone for this cowboy town complete with old-fashioned gunfights and lasso lessons. Eagle Point, named for the eagle-like rock formation visible there, provides stunning views 4000-feet down to the bottom of the canyon. Finally, Guano Point offers a spectacular viewpoint that juts out into the Grand Canyon and offers a nearly 360-degree view. Return to the terminal having explored the Grand Canyon by both air and ground on this unique adventure! An approximate 20-minute aerial flight. Arrive at our terminal for check-in. After seeing the canyon by air, board a shuttle bus to multiple points to explore the canyon rim on foot. Visit an Wld Western town complete with cowboys and gunfights! Learn how to rope and quick draw like a cowboy. Watch live cultural dances performed by the Hualapai and explore Native American dwellings. The legendary eagle-like rock formation can be seen from this point. Panoramic 360-degree views of the canyon from every point of this location. Take advantage of the creative photo opportunities!